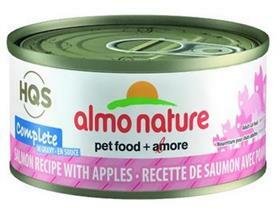 Watch your furry friend flourish on Almo Nature’s Complete Salmon Recipe with Apples Grain-Free Canned Cat Food. This all-natural, high-quality food features salmon as the first ingredient, appealing to the inner tiger lurking in every kitty! Tender chunks of fish are cooked in their own juices while tasty apples provide fiber and flavor. Plus, Almo Nature Complete comes in a wide variety of flavors to satisfy even the finickiest of felines—rotate your furry friend’s diet and provide them with a new, fresh feast every day! All-natural formula is grain-free, GMO-free and crafted with 100% natural ingredients. Apples provide added fiber, phytonutrients, calcium and vitamin K.
Grain-free formula is easy to digest and is great for sensitive cats or cats with digestive issues. Cooked and served in their own broth to increase palatability and reduce boredom. Naturally rich in taurine, amino acids and protein for a complete and balanced meal. Ingredients: Salmon, Water Sufficient For Cooking, Apple, Tapioca Starch, Natural Flavor, Sunflower Oil, Tricalcium Phosphate, Guar Gum, Minerals (Zinc Oxide, Reduced Iron, Sodium Selenite, Manganese Sulfate Monohydrate, Copper Glycine Complex, Potassium Iodide), Taurine, Vitamins (Vitamin E Supplement, Niacin Supplement, Vitamin A Supplement, Vitamin B12 Supplement, Vitamin D3 Supplement, Calcium Pantothenate, Riboflavin Supplement, Pyridoxine Hydrochloride, Biotin, Folic Acid, Menadione Sodium Bisulfite Complex (Source Of Vitamin K Activity)), Choline Chloride.